My Samsung Smart TV recently started behaving strangely, I can change the channels, increase/decrease volume, access TV menu and change settings, no issue at all. The problem starts whenever I start the Samsung Smart Hub app! If I open the browser on TV, the pointer moves a little bit and stops responding for few seconds. Again it moves a little bit and then stops, really irritating. Same with YouTube app, the pointer is totally unresponsive but I can use the arrow keys to control the video or to type using the on-screen keyboard. 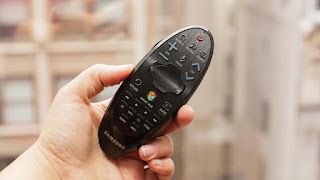 I did a lot of research, many asked to go close to the TV and operate the remote, some suggested to remove the batteries, then while holding the power button, replace the battery by pressing and holding the power button, but none worked for me. Also I tried turning the power off for few minutes, then turn it on, also did factory reset, nothing worked. I read somewhere(in CNET forum) it is a hardware/firmware issue which Samsung could not fix till now but in my case it was working before with no issue at all, even there were no software updates recently, so definitely it is not an existing hardware/software issue. Some people reported, their issue got fixed when they connected the TV to internet via Ethernet, claiming the bandwidth used by the remote is conflicting with the wifi etc, still the question in my mind was, how this was working before? Finally I decided to contact Samsung customer support, just before dialing, my wife suggested putting new batteries in the remote, I removed the Korea made "Rocket" batteries and put brand new Energizer batteries, you won't believe, the remote started working as before!!! So, it was all because of weak batteries, the pointer was not responding. Some people reported the remote responds when the move close to the TV, this confirms weak signal from the remote due to weak batteries. Not sure how it worked for few when they connected their TV directly via Ethernet, could be they were operating the remote very close to the TV while testing. Anyway, if you are facing similar issue, first replace your remote batteries with new high power batteries and check if it is working, if not contact the customer support. You saved my life. I was going nut. Did your pointer get lost when trying to navigate on web browser? If yes then we have the same issue and I hope it can be fixed by changing bateries. Been experiencing a similar problem in the last couple of days. I just came across this article and after implementation....remote working just fine. From Nairobi-Kenya Thank you. wow this worked like a charm, but I swear we had already tried the battery thing. But for what it counts I am happy! This did not work for me. I had to go in and do a software update, that fixed it. Is there any app through which I can turn on my TV as my remote is not working? You can use the hard buttons behind the tv. It is wall mounted and I do not see any hard button. There used to be an android app I used before (which not installed now on my phone). If you know the name please let me know. Also, sometimes the remote works and sometimes doesnt. I am using 2 AA batteries with 1.5 volts. New Model televisions use a One Button control instead of touch buttons to control the TV without the remote control. This control is located in the bottom center of the TV. Or side side bottom. I tried changing batteries and still had the same issue. I tried pairing the remote once again. Same issue and the final fix was to reset the Samsung tv. Below is the link on how to reset tv. Had the same issue here, batteries were good, no updates to be had. Did the reset of the TV (thanks Lopz z) , and everything worked fine after that. How did you reset? I do not see a way to do that. Hello Brandon, glad to hear it resolved your issue. I unplugged the TV for 20 seconds and plugged it back. This just happened to me on a new 6 series Samsung. Pointer was stuck half in view at the bottom of the screen, i thought it was a bunch of dead pixels ubtil i read this! Changed the batteries and all is well and good now, phew!